Sarah has never seen a girl so precious as the gray-eyed child in a crowded airport terminal--and when a second-chance encounter with Emma presents itself, Sarah takes her, far away from home. But if it's to rescue a little girl from her damaging mother, is kidnapping wrong? If you start this book with looming deadlines or close to bedtime, be prepared to disregard both once you start reading Rea Frey’s immensely absorbing novel, Not Her Daughter. This is, hands down, one of the most compelling and complex books I’ve read so far this year. It is a fast-paced story that alternates between two female narrators, leading up to and during the kidnapping of a five-year-old girl. This book immerses the reader into the minds of two very different women. One, a successful and recently single business woman with an unhappy past, and the other a self-loathing, frazzled mother of two in an unhappy marriage. Both women’s lives intersect when one abducts the five-year-old daughter of the other. I was shocked and appalled by the narrators as they deliberated their way through the unthinkable–the abduction of a child. The characters are both deeply flawed and, perhaps, relatable to the fringe imaginings of any unhappy mother or neglected child. The story probes the female experience of motherhood and mother-daughter relationships, bringing the most disturbing and base thoughts to the center of the page. As readers, we are forced to examine our own thoughts and contemplate an impossible question: Can the abduction of a child in an unhappy living situation every be justified? After reading this novel, you will most likely be compelled to discuss it with a friend or recommend it to your local library as a book club pick. Those who love to read psychological suspense and/or domestic dramas should grab a copy of this book stat! 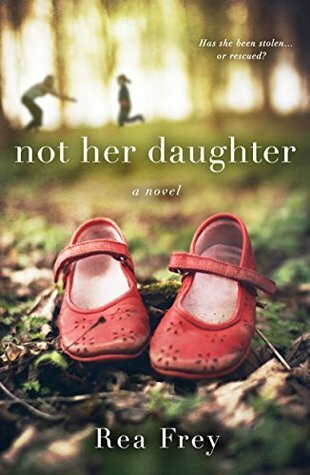 Have you already read Not Her Daughter? I’d love to hear your thoughts in the comments.